Yesterday I organized a pool party in my backyard for my kids and my sister's kids. It was a great success. The kids had fun and we got to spend sometime in the sun. I may have made too much corn. Which turned out great, because I finally got to make a simple salad from leftover corn. Why should you eat corn? Corn has it's benefits. It helps with metabolism, it's rich in vitamins A, B, E and many minerals. It's also high in fiber and antioxidants. And as a bigger bonus, the green onion in this salad has a high content of vitamin A in it and will benefits your eyes. To top it off, olive oil is armed to protect your heart and prevent it from developing any cardiovascular diseases. Take the kernels off the cob. Chop 1 stem fresh green onion. 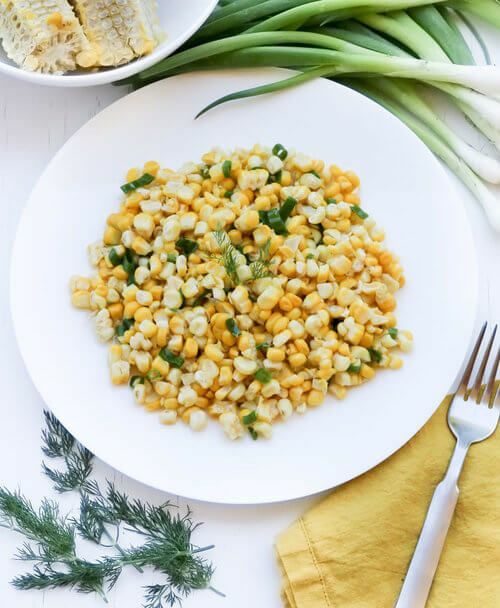 Combine corn and onion with 1 Tablespoon extra virgin olive oil, 1/2 Tablespoon white wine vinegar, and 1/2 teaspoon of salt (or to your taste).